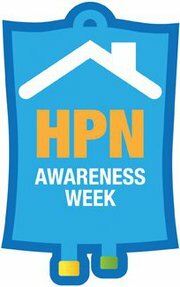 Last week was Home Parenteral Nutrition (HPN) Awareness Week. As many of you know, Total Parenteral Nutrition (TPN) keeps me alive. It’s called Total PN because I receive essentially all of my nutrition parenterally – through a line in my chest that goes straight to my blood (“parenteral”) rather than through my gut (“enteral”). Fourteen hours every day I am hooked up to an IV line that delivers this nutrition. The other ten hours I am hooked up to a line that delivers what is essentially sugar-water which keeps my blood pressure and blood glucose levels stable. I am very grateful for these lines. However, there is a very real and very serious downside to requiring parenteral nutrition. Part of this downside is that a line that constantly enters your blood system, right next to the heart, where it can be pumped throughout the entire body; this line can introduce bacteria and yeast to the bloodstream causing a very serious infection called septicemia. This describes the reaction the body has to foreign bodies in the blood stream. (“Sepsis” is the same reaction but to an infection in any part of the body.) It can involve changes in temperature, heart rate, blood pressure, white blood cell (WBC) count, and respiration rate. Septicemia has seemed to find a friend in my body. And usually when it hits, it hits hard – bordering and even reaching septic shock. It’s scary and painful. My brain feels like it’s a ferris wheel, spinning upon itself, and nothing makes sense. And because my white blood cell count – white blood cells fight infection – are low/low-normal when well and do not seem respond to infection, we have no warning. In fact, doctors have nearly discounted my fever numerous times because of a lack of WBC response only to find out my body is going full-out septic just hours later.